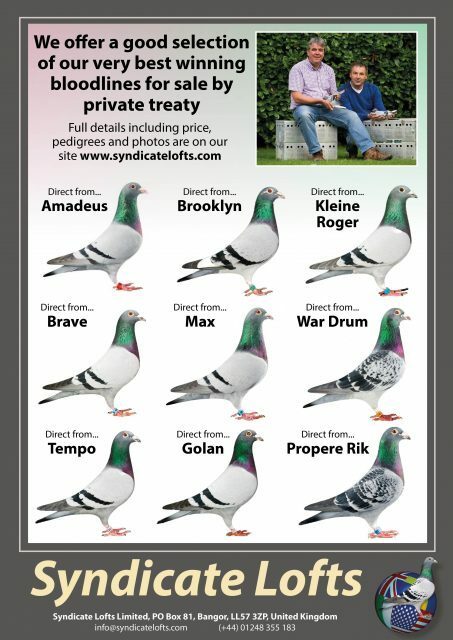 Syndicate Lofts – Spring Sales List June 2018…. Home › News › Spring Sales List June 2018…. Spring Sales List June 2018…. Spring Sales List. Birds now sold. Many thanks once again for your support. Like to purchase lot 35 if still available I live in the USA and would need to import her obviously but I’m sure you have imported before . Thank you and let me know if she is still available! Hi whare are the birds now . After purchase thay will be picked from one location? The birds are in North Wales ,UK and can be collected anytime. I am sorry but we do not sell youngsters for racing. We race them all ourselves up to May hatched.